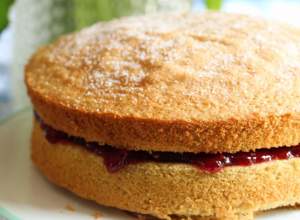 Everyone love a Victoria Sponge, and its easy to make here’s how. beat well to a creamy consistency. then fold in the flour and mix well. spring back when gently pushed in the middle. onto a wire rack and cool. Spread the jam onto one cake and top with the cream if using. Sandwich the cakes together and dust with icing sugar.